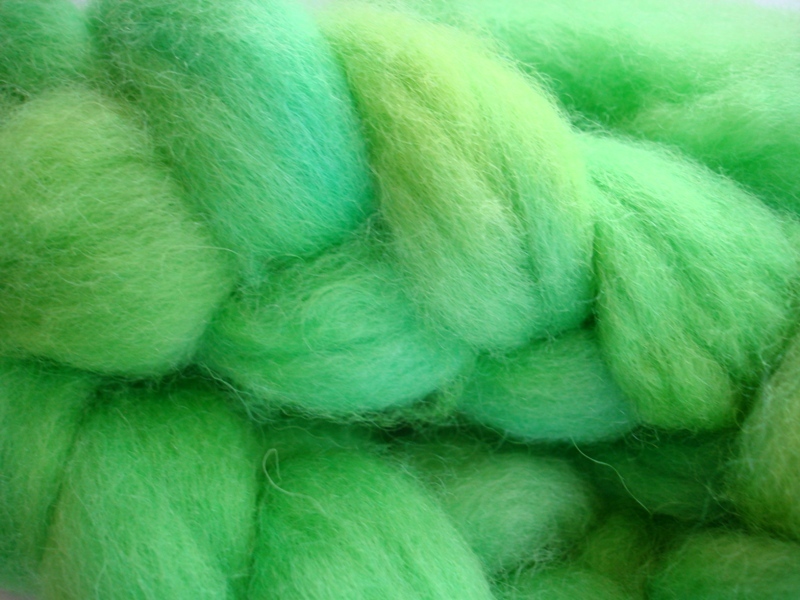 You are currently browsing the category archive for the ‘felting’ category. 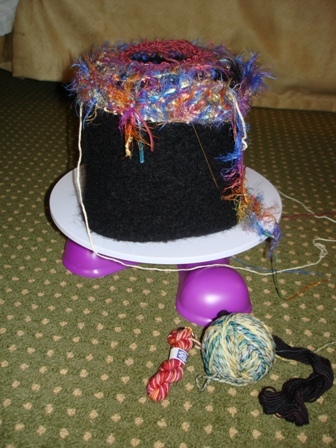 Here’s what I’ve been up to lately fiber art-wise. the purple ones for a friend, and there’s also a burgundy pair I haven’t quite finished yet or decided who to give to. 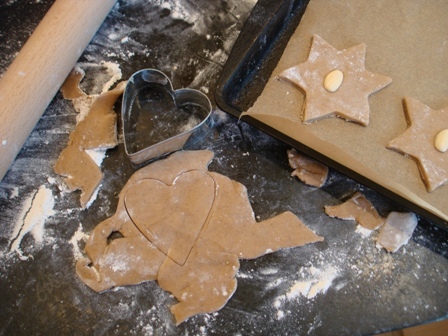 And all through the house, cookies were baking . . . 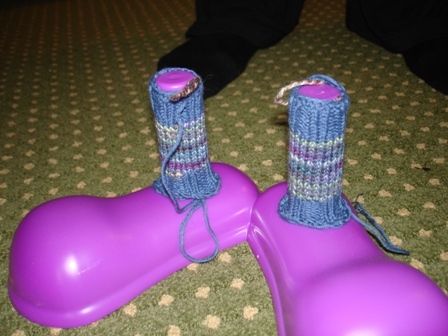 Slippers were drying . . . Yes, it is, my dear, and I’m here to wish you a merry one. I know I’ve been busy, and not come to see you lately, but I’ve thought of you often. So let’s raise a glass together and move into the New Year resolved to enjoy each other’s company more. 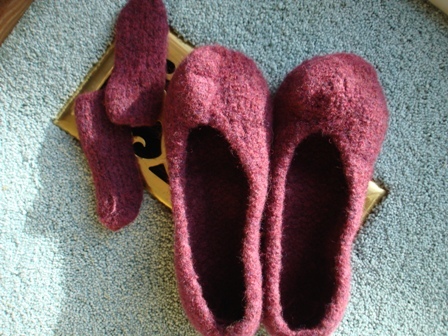 PS — The slippers are French Press felted slippers, and the pattern is available here. I see that she is shipping PDFs today, so if you, dear Reader, work really fast you might be able to get pair of these babies done in time for giving tomorrow morning. 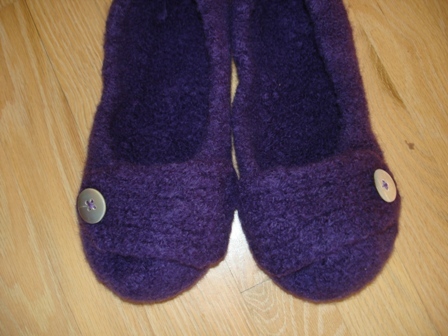 And the recipient will love you, because they are warm, cozy, and oh, so stylish. I’ve made one pair for me and two more for gifts, and they are great. In honor of Earth Day, and because I hate to let a good marketing opportunity go by, I’ve posted a couple of Earth Day Specials at my Etsy shop. 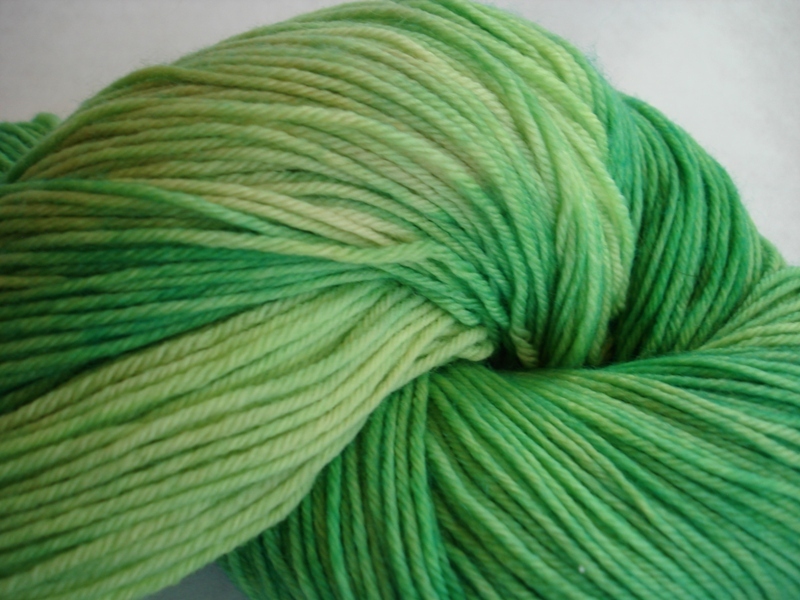 and a skein of sock yarn with a story that began here, colorway Ivy, only for sale until I log back in on Wednesday, because it’s not on any of my usual base yarns, and if it doesn’t find a nice home quickly, I think I’ll make it into socks. I’ve also some great new base yarns: BFL superwash, SeaCell/Merino superwash, and Merino laceweight. If you haven’t looked lately, I’ve uploaded a lot of new items, and more to come this week and next. And the offer regarding the free WrapSack (scroll to the end) is still on! The Internet is an amazing thing. It has its odder corners, and as the Peter Steiner cartoon in the New Yorker put it, “On the Internet, nobody knows you are a dog”, so deceptions can occur. But connections with real people do happen, and sometimes you have the treat of meeting in person. Cathy of Hither and Yarn was in town, on her way to Blue Moon Fiber Arts Sock Camp, on Orcas Isand, and we arranged to get together for some serious eating, sightseeing, and chatting. No yarn shopping, because she’d been on yarn crawl the day before with other sock campers. Greg and I picked her up at her hotel and took her to Top Gun for dim sum, which was fabulous — the best I’ve had in Seattle. 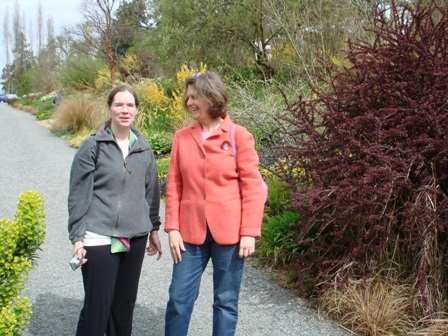 Then, on to Bellevue Botanical Garden for some fresh air, scattered sunshine, and flowers. Here we are on the path below the perennial border. Cathy is on the left, and note the Ravelry scarf peeking out from under her jacket. 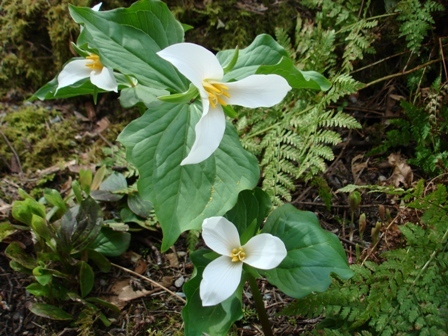 The trilliums were blooming in the woods. Cathy said they also grow in Wisconsin, where she is from, but she usually doesn’t get into the woods in the spring, so it was nice to see them here. We drove into Seattle for a quick peek at the cherry blossoms on the UW campus (a little past their prime, but still nice), then on Pike Place Market browsing and stocking up on used paperbacks for her spare-time reading at Sock Camp, with a stop for coffee and pastries. A stroll down to the waterfront was next, but it started raining, so we didn’t make it to the Olympic Sculpture Garden. As Cathy had knitting homework to complete, we headed back down to her hotel. Knitting homework? Yes, apparently Sock Camp assigns a task to be completed before you arrive. You would think it would be socks, but no, it’s . 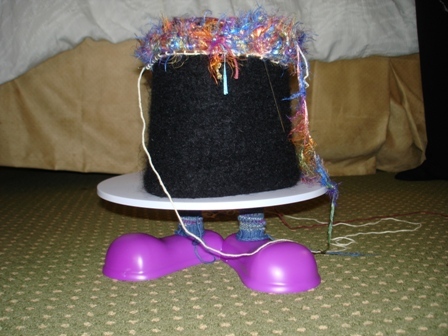 . .
socks on the feet of the base. That yarn crawl I mentioned — Cathy had bought rather a lot of yarn and asked if I could ship it back to her, so she wouldn’t have to buy another suitcase, pay excess baggage fees, etc. So I got to take it home and fondle it discretely. That lady can shop! Kauni, Socks That Rock, Mountain Colors, Panda Silk . . . and she trusted me to mail it all to her! Yeah, rather a lot of yarn. 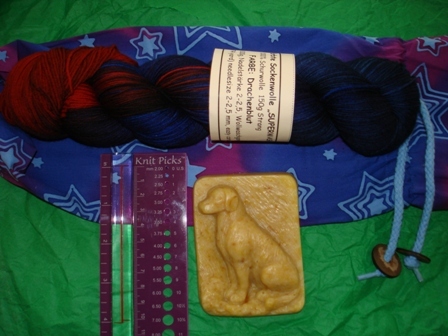 Some handmade soap, a KnitPicks View Sizer, and a skein of the much-sought-after, impossible-to-get Wollmeise Yarn, in the Drachenblut colorway. Wow! Thank you, Cathy! 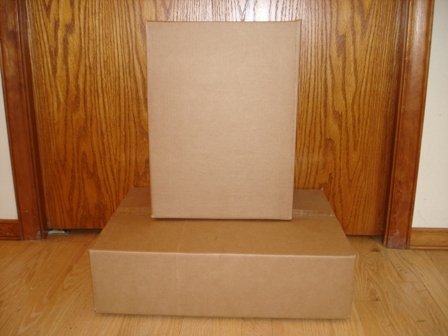 One of your packages has a couple of extras in it that I hope you like half as much as I do these goodies. Please note the cloth sack that everything came in. It’s a Wrapsack, yet another Internet thing. It has a unique number on the tag, and I’ve logged it in on their website. When another person receives it, they can log it in, and its journey from person to person can be followed if you have its number. I’m giving it to the next blog reader who buys something at my Etsy shop — just put “Wrapsack” in the “comments to seller” box, and it’s yours. I went down to Seattle today to meet Susan for lunch — she’s a fellow member of The Gunroom, and also a Whipstick Knitter. Having a little time to kill before our lunch, I went over to Pike Place Market, and stopped at Beecher’s Cheese to replenish the larder a bit. It was the first time I’d been there when they were making cheese. The blurry, through the window, picture above shows just a section of a vast oval vat, one of two that was being stirred to create curds. The hip young thing behind the counter asked me what is becoming The Usual Question: “Did you knit that purse?” She went on to explain that she’d just taught herself to knit, but hadn’t tried felting yet. I gave her a couple of tips and told her about Knitty, but she was already in the know. I met Susan at Wild Ginger, and passed on some yarn for her to use in an ongoing charity project of hers, knitting wee blankets for kittens brought to animal shelters. Appropriately enough, we both ate with chopsticks, expertly wielded. A quick return to Pike Place Market yielded some roasted fennel ravioli and a sourdough ficelle from DeLaurenti and South African Boerewors from Uli’s Famous Sausage, all of which should make a tasty dinner. The harissa from Market Spice will be for another day.